Happiness is enjoying the party to the fullest, but the most happiest thing is waking up without a hangover! I know after walloping a party everyone wishes for the same. But, it is nearly impossible to wake up normally even after having some extra shots of Alcohol. Few extra shots don’t kill but will show you the hell. The only thing that can help you is opting some Home remedies for hangover. Too much fun last night gives you too much pain in your head when you wake up. So, to deal with this, we need some basic tips and Home Remedies for Hangover. Here are few of them which can treat hangover in a better way. So, have a glance at them and use whenever necessary. First of all, what will happen in hangover? Do you know? After drinking high amounts of alcohol, our body tend to lose most of the mineral salts from our body which will give us the ill-effects like a headache, Nausea, and vomiting. So, What helps a hangover? To restore those minerals we should have some mineral rich foods like Bananas. Bananas are rich in potassium which can reduce the dehydration symptoms. So, instead of turning upside down holding your head, you can grab a banana and just eat one or two to get instant relief from hangover effects. The best of all natural hangover cure drinks is Banana shake. As we know for every health issue, lemon is the best solution. Most of the home remedies are incomplete without lemons. So, use these tiny drops of lemon as the remedy for hangover. As said earlier, Alcohol causes PH imbalance in our body by flushing out the electrolytes. So, to bring back the electrolytes and to maintain the perfect PH balance in the body, have some lemon juice with a pinch of salt and sugar. It works great to treat severe pains of Hangover. Of all the Home remedies for hangover, this is the best medicine for hangover and simplest one. Salt- A pinch or two of salt. Select a ripe lemon and cut open it. Remove the seeds from the two halves and squeeze out the lemon juice. Add a cup of water to it and mix well. Now, add two pinches of salt and two tablespoons of sugar or honey and mix well. Drink this Hangover medicine immediately after you get up from your bed to get the hangover sickness cure. Cut a two-inch ginger piece and scrape off the outer peel. Cut the ginger into pieces and add to a kettle. Add a cup full of water to the ginger and let it boil for 5 minutes. Then, strain the ginger decoction and remove the pieces of ginger. Add a sufficient amount of honey to it and sip this in still hot condition to get quick relief from hangover. It is the easiest treatment for hangover because at the time of a severe headache all the preparations mentioned above is not possible if you are alone. So, use Ice compression for hangover relief. The best way to get rid of hangover headache is holding the ice pack on your head for 10-15 minutes. Yes, many of us use these sports drinks regularly to drink post workout. Now take out the same sports drink to get over hangover symptoms. So, what is the purpose of drinking the sports drinks to treat the hangover? Yes! There is a strong reason behind this. Sports drinks are the beverages that are rich in electrolytes and also instant energy giving drinks. After a heavy workout, the athletes drink these to get back the energy instantly. So, try this sports drinks for hangover treatment. Most of the people suggest these hangover relief drinks as the best cure for hangover. These sour red fruits are rich in fructose (a type of sugar present in most of the fruits). The fructose helps in enhancing the metabolism of alcohol. So, this is the reason behind opting tomato juice to compensate the dehydration. So, prepare fresh juice of tomatoes, or you can also opt for tomato soup. Salt- adjust according to taste. Wash the tomatoes and add them to boiling water without chopping. After 5-10 minuted turn off the flame and drain the water. Remove the outer skin of the tomatoes and blend them to make a fine paste. Take a saucepan and add two tablespoons of oil to it. Add a tablespoon full of garlic and fry them until the raw smell goes off. Add the tomato puree to it and let it boil for 10 minutes on a lower flame. Then add chili flakes, salt and turn off the heat. Add crushed thyme to it and have it when it is in a hot condition. Even after the symptoms like a headache, vomitings disappear, the fatigue won’t leave us that faster. So, to treat this condition, the peppermint helps us a lot. The strong flavor of the peppermint awoke the weary soul. Peppermint also helps in enhancing the digestion process and cure the indigestion problem too. So, have a cup of Peppermint Tea after you wake up from the bed. It is one of the healthiest Home Remedies for Hangover and indigestion caused by excessive alcohol consumption. Take 2 cups of water and let it boil for 10 minutes. Then, add the peppermint leaves and turn off the heat source. Close the lid of the vessel and leave if for 5 minutes so that all the goodness of the peppermint gets into the water. Now, Pour the tea through a tea strainer. Add three tablespoons of honey and pour it into the cup and drink hot. 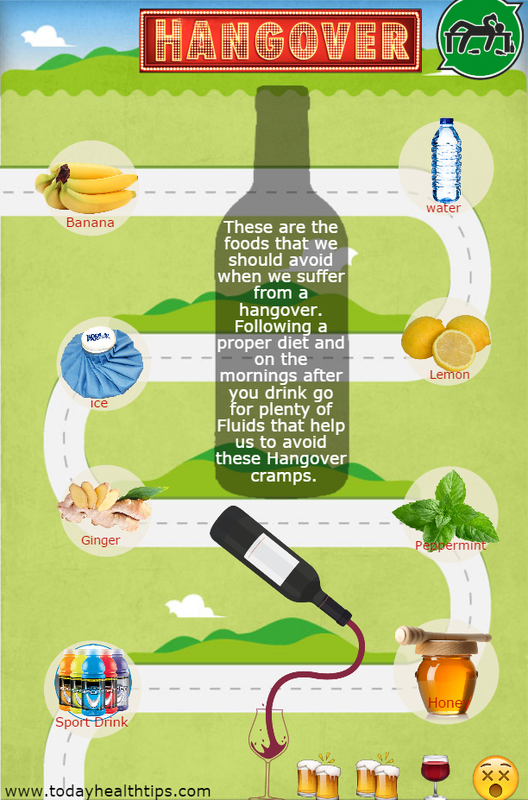 So, these are the simple Home Remedies for Hangover which you can use instantly. 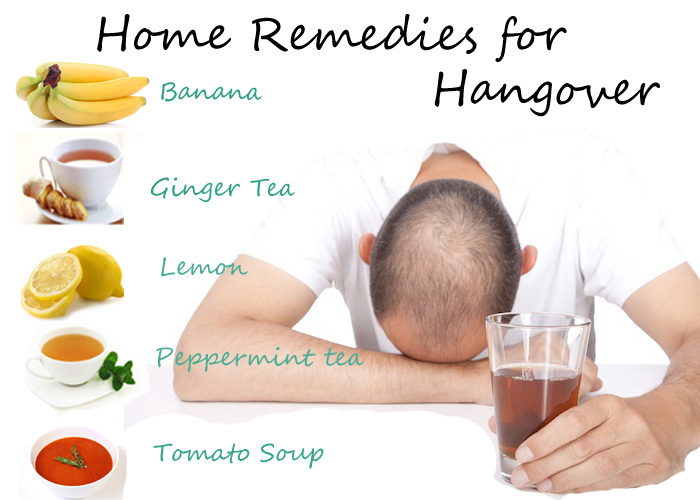 Instead of Hangover pills, depend on the hangover home remedies at home for safer treatment. As it is not a serious disease or illness, the best way to get over a hangover is following the Hangover remedies at home.